Alastair Kenyon “Alec” Campbell was born in Southampton on May 29th, 1890. His father worked for the Ordnance Survey and mapped out a future for Alec that included attendance at the prestigious King Edward’s School, in the city. While at school, Alec’s sporting prowess came to the fore; he skippered the school team and played for England’s powerful Amateur side in 1908 - the same year that they won Olympic gold in football. He remains the only schoolboy ever to play at such a high level, as far as records show. 1908-9 saw him play first-class cricket for Hampshire and debut for Southampton. Described as “Tall, with telescopic legs,” Campbell soon attracted the scouts and a move to Glossop came in 1913. After they left the League he had a short spell with West Ham before returning to Southampton. 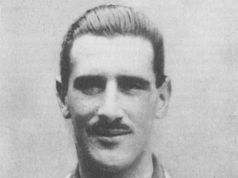 He skippered the side from the centre-half position as they made the transformation from Southern League to Football League, and ended an 18-year association with The Saints in 1926, when joining Poole Town as player/manager. Under his management, Poole consolidated a place in the Southern League and reached the third round of the Cup, going out to Everton at Goodison Park to a Dixie Dean hat-trick. All this came to the attention of Chesterfield’s directors and, when they elected to dispense with Harry Hadley, Campbell was interviewed and appointed from April 25th 1927 at £500 per annum – the most a manager had ever been paid here. Jimmy Cookson was sold from under him within a fortnight or so of his starting the job but £2,500 of West Brom’s money paid a lot of debts and allowed Campbell some change to rebuild. He brought Ralph Williams – a prolific scorer at non-league level – from Poole and went back to The Dell to bring Frank Matthews up, too. Manchester City provided John Elwood and Bill Turnbull. These were all fair players and would have embellished a decent squad but the club, in its wisdom, introduced a “residential” clause to playing contracts and good players like Arnold Birch, Jacky Fisher and Sam Hopkinson left, rather than move house. The end product was a disjointed playing staff that was also perhaps a little dispirited by the departure of the popular Harry Parkes. The last two games of 1926-7 were both lost, but this was written off as the new man got his feet under the table; a home defeat to Wrexham on the opening day of 1927-8, however, set a low standard that the club barely rose above during Campbell’s ultimately short tenure. Barrow were beaten six-nil as the side hit 11th place but this was the highest they reached under Campbell. The forwards were functioning well enough, but the defence was hopeless, with a lack of tactical awareness leading to the team conceding 27 goals in the season’s opening 14 games. When only 2,354 were tempted through the turnstiles by the visit of Wigan Borough in November 1927, the alarm bells went off in the boardroom. An emergency board meeting took place in Harold Shentall’s Glumangate office on November 23rd 1927. Six directors, the financial secretary and the club’s solicitor, a Mr Wakeley, crammed into the room to discuss Campbell’s fate. Mr Wakeley was instructed to obtain the manager’s resignation and this he did within an hour, on promise of a £40 golden handshake. The speed with which Campbell agreed to go suggests relief on his part that his ordeal had come to an end. Mr Black, the financial secretary, was appointed caretaker manager, pending the appointment of a successor to Campbell. It is too easy to dismiss Campbell’s time as a mistake, from start to finish. Many of the players he brought in were rushed out after Campbell left, and one or two good ones were lost in the haste to exorcise his memory from the club. Campbell saw the value of youth and promoted Bernard Oxley, Charlie Bicknell and George Beeson to the professional ranks, all of whom would bring in handsome fees when their turn came to move upwards. The brevity of Campbell’s period of office makes the man difficult to assess. He was still just young enough to return to playing, as an amateur with Basingstoke Town and the Green Waves club, in Plymouth, but he never re-entered the world of senior football management. As an educated man he might have appeared aloof to the average player or supporter but there was no questioning his commitment to the job or bravery in taking the task on. His departure had consequences that rang through the club's organisation since his arrival and costly departure can be seen as the trigger-point for Harold Shentall, whose family by now held the majority of shares, to begin the process of becoming Chairman. At the end of the 1927-8 season Harry Cropper was persuaded to stand down and Shentall took his place - one that he would occupy until his death in April 1971. Campbell had a keen sense of duty and did his “bit” with the Royal Artillery in World War One, being commissioned as a 2nd. Lieutenant. He retained this rank with the RA in the Second World War, but lost his life in June 1943 near Portsmouth, while on active service.